Heat oven to 350°. In 3-quart saucepan, heat water, milk and butter to boiling; remove from heat. Stir in both pouches potatoes just until moistened; let stand 1 minute or until liquid is absorbed. Stir with fork until smooth. Spoon half of mixture into 2-quart ungreased baking dish. Sprinkle with 1/2 cup cheese and half of the onions (about 3/4 cup). Top with remaining potatoes; sprinkle with remaining cheese and onions. Bake 10 to 15 minutes or until cheese is melted and onions are golden. 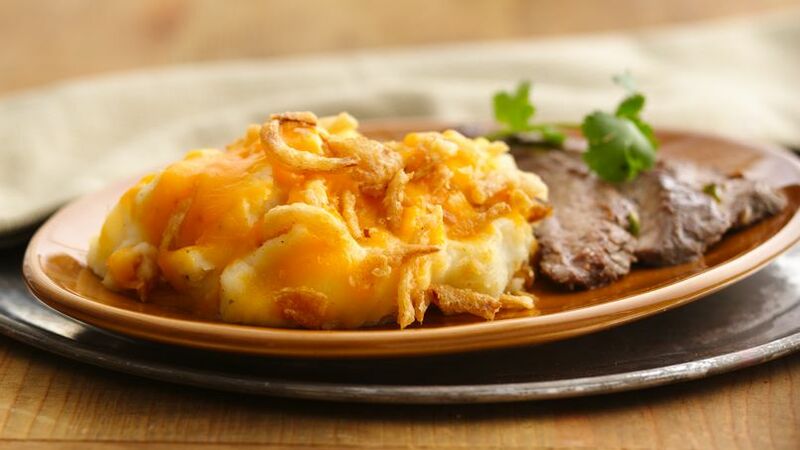 Baked Betty Crocker® mashed potatoes combined with French fried onions and cheese make a delicious side dish.